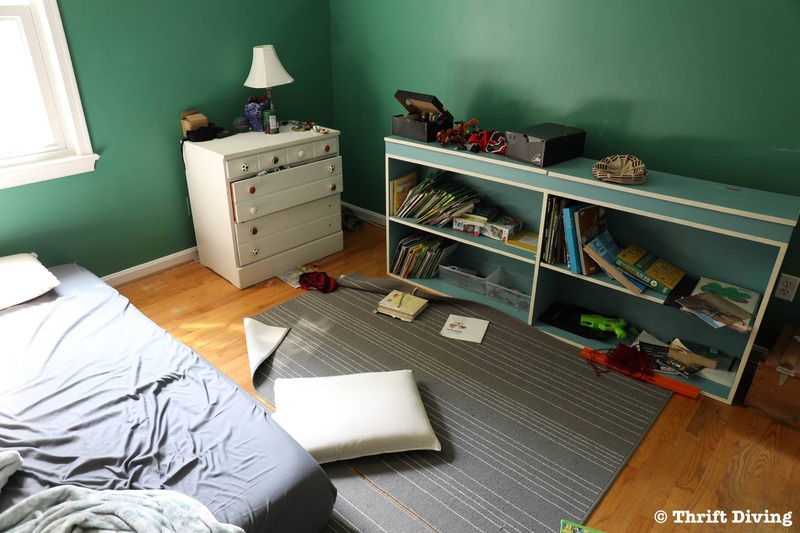 You are here: Home / Room Makeovers / Bedrooms / BEFORE & AFTER: My Boys’ Green Bedroom Makeover With Carpet One! 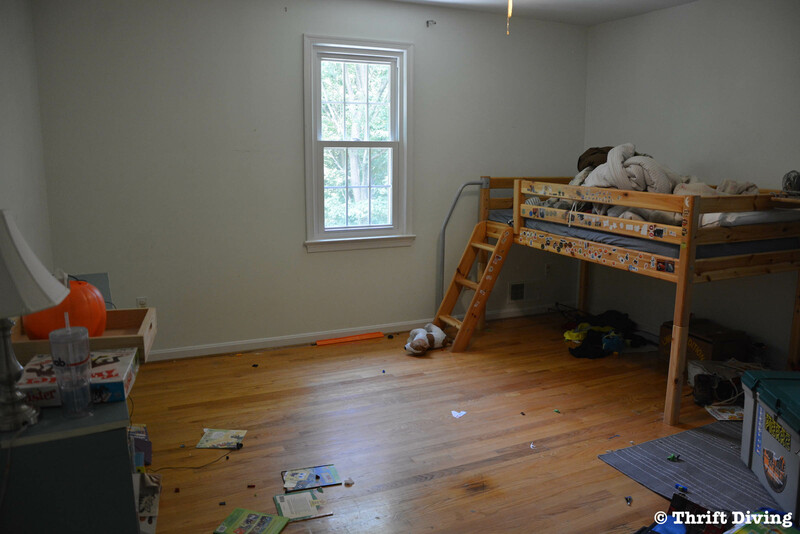 This boys bedroom makeover is brought to you by Carpet One. All opinions are my own. 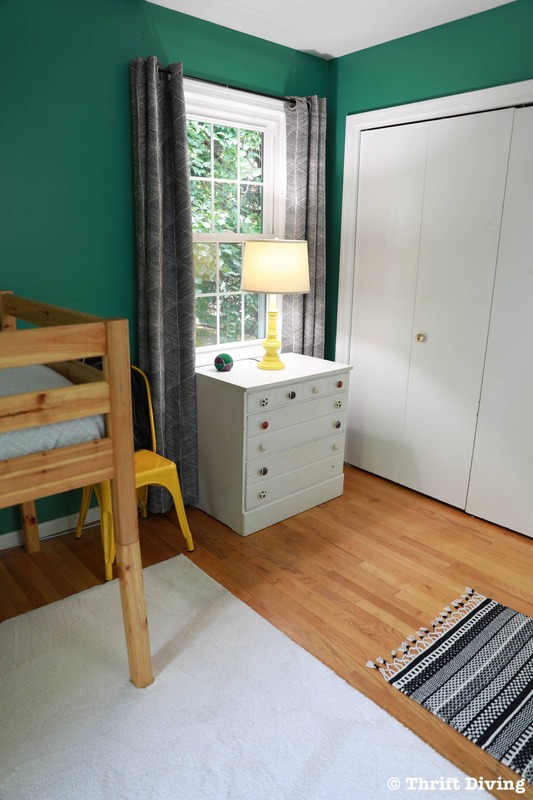 For more bedroom makeovers, check out my oldest boy’s room makeover, my master bedroom makeover, and this pretty guest bedroom makeover. When I was a kid, I don’t remember what my childhood bedroom looked like. I remember the basic structure of it, but there were no particular colors or features etched in my memory. We rented, so painting was out of the question. And the decor–basic blah. Up until middle school, my older sister and I shared a room. I remember our bunk beds (big ‘ole chunky pieces of dark wood) and not being able to touch the perfume bottles on her dresser. Aside from those things, I remember very little about our bedroom. I worried that my kids would also grow up only knowing their room as a place to go to sleep and wake up, not a place to hang out with family. Bedrooms are supposed to be an oasis, a clean place to create fond memories of playing with your siblings, and a place that feels cozy and relaxing. 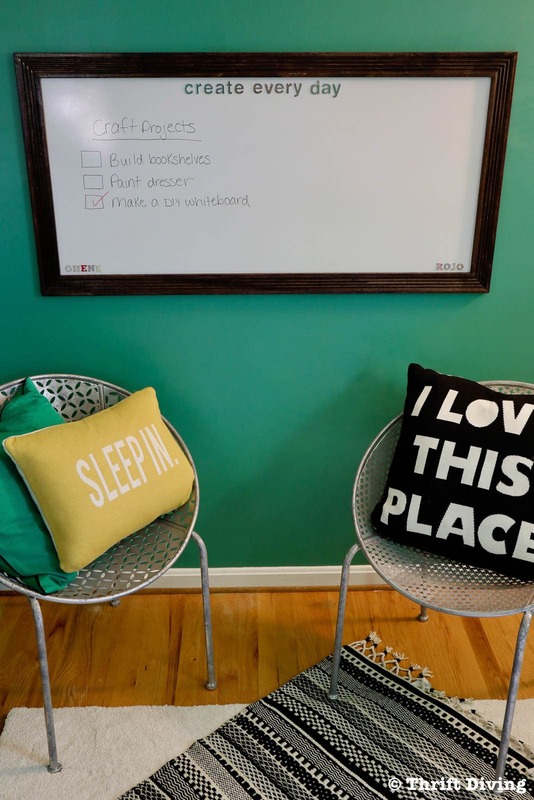 Since moving into this home nearly 8 years ago, the kids’ room has gone through a couple of transformations, but none of them encompassed that cozy feeling. 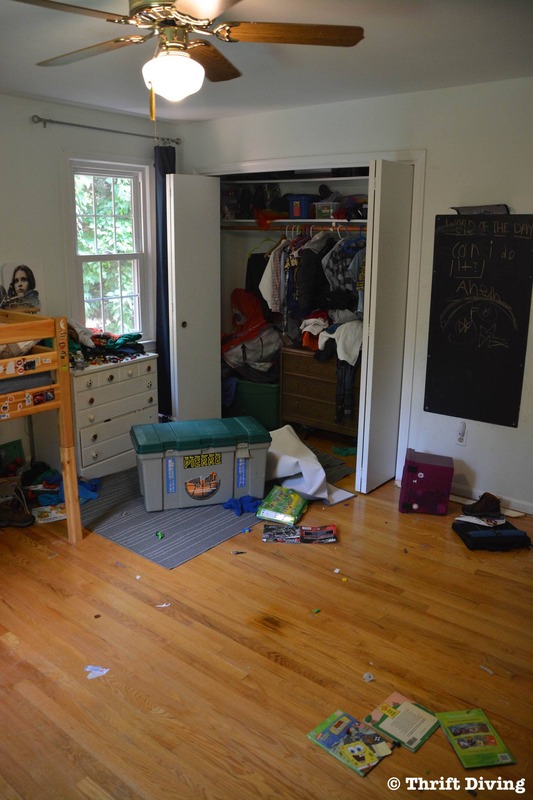 Rather, the room has always been a place where the kids simply dump their dirty laundry and scatter LEGOS all over the floor in pursue of unexpected bare heels. Because it’s always been a messy place, I’ve never wanted to invest lots of time into this room. Despite them growing up (now ages 12, 8, and 6), messes are still an everyday occurrence – spaghetti mashed into the carpet…discarded lollipop sticks get stuck…and gum…well, we don’t even want to go there. They’re getting better about their messes, but we’re not 100% mess-free yet. LOL. But having messy kids isn’t a good excuse to not investing in your home and your decor. Rooms should be cozy. Rooms should be clean. And every kid deserves a cozy, clean bedroom as their sanctuary–a place they’ll look back on fondly when they grow up. Bye-bye messy, uninspiring boys bedroom! 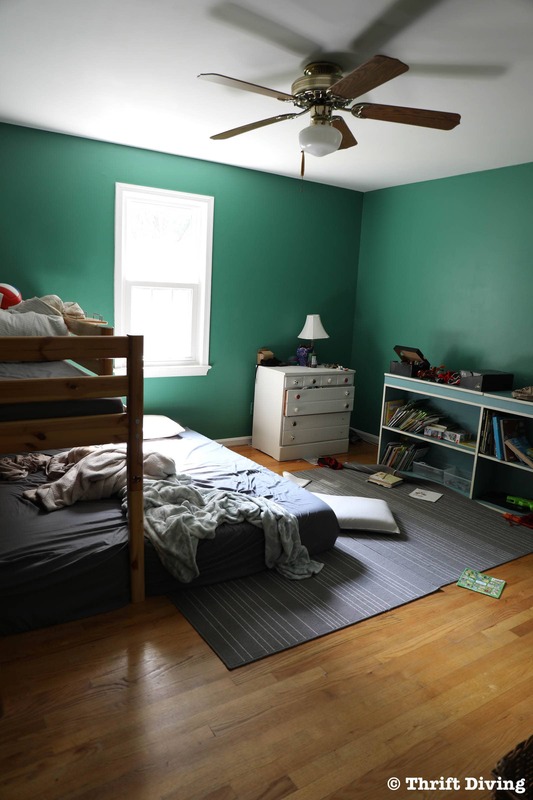 I painted the kids’ bedroom green (which was a “color stretch” for me since I am terrified of dark colors! ), but even in that attempt, it still lacked warmth, and I skimped on finishing the room. Before you know it, it became, yet again, another catch-all for mess and clutter. But it doesn’t look at way anymore! 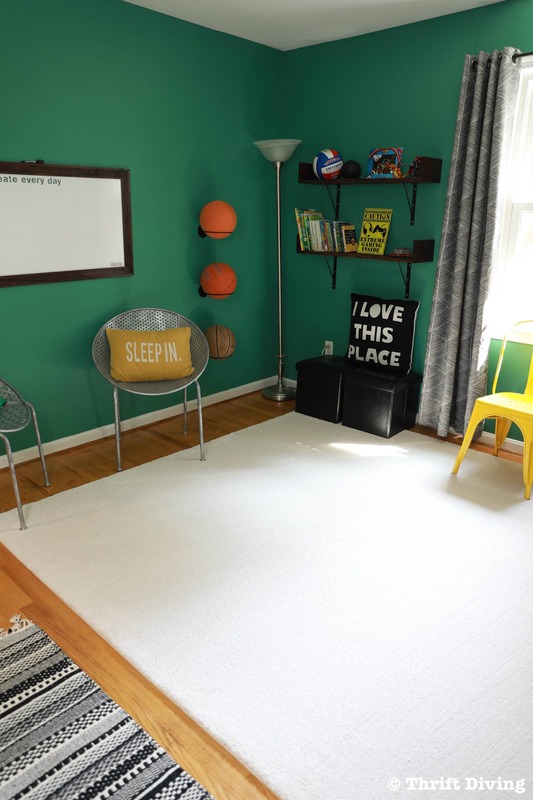 I’m super stoked to show you the kids’ room makeover! But this is the third room in my home that I’ve gotten custom cut and bounded carpet from Carpet One and I’m really impressed with how their carpets hold up and stay clean! 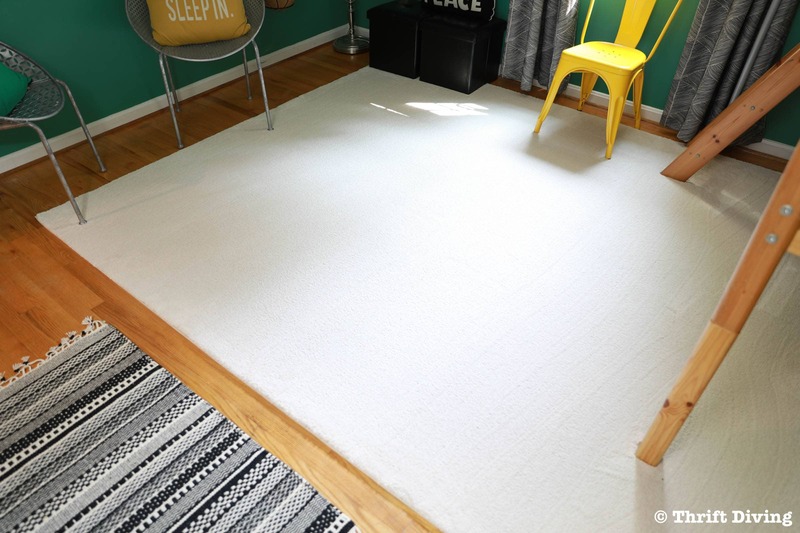 This 8′ x 10′ carpet is the brand Relax it’s…Lees® with stain resistance. It’s perfect for high-traffic areas or kids rooms. This room needed a light-colored carpet because the walls are so dark. Since it’s got stain protection and is durably constructed, I don’t have to worry that the kids will dirty it up or destroy it because it’s a light-colored carpet. Poor kids didn’t even have curtains up at both windows! Well, they used to….before they accidentally ripped one of them down. I just never replaced it because…well, I knew I would eventually be working on their room makeover. So they went probably a good year before having curtains up at both windows! During the early morning, when the sun comes up behind the house, their bedroom is often the first room to be assaulted with sleep-disrupting rays of sunlight. One thing that has always annoyed me about the kids’ bedroom is that their ceiling fan was so…..bleh! That old ceiling fan was the only source of light. A single bulb wasn’t enough, and it just left the room feeling dingy. Let’s not forget that the ceiling fan would wobble and shake when turned higher than the lowest setting. It probably just needed tightening, but since it was so old, we had to get rid of that thing! I installed a new ceiling fan that is much more modern! The only thing is that it doesn’t have a light attached. I’ve got a light kit that I plan to update it with soon. But it looks waaaaay better, doesn’t it?? And it doesn’t wobble! I got it from The Altura Collection. Since I want this room to a “hang out central” I bought some new chairs to go in the room, too. The plan is to refinish a small desk to put in the kids’ room so if they’re doing homework on want to sit at a desk to play with LEGOS, they’ll have a place to sit. 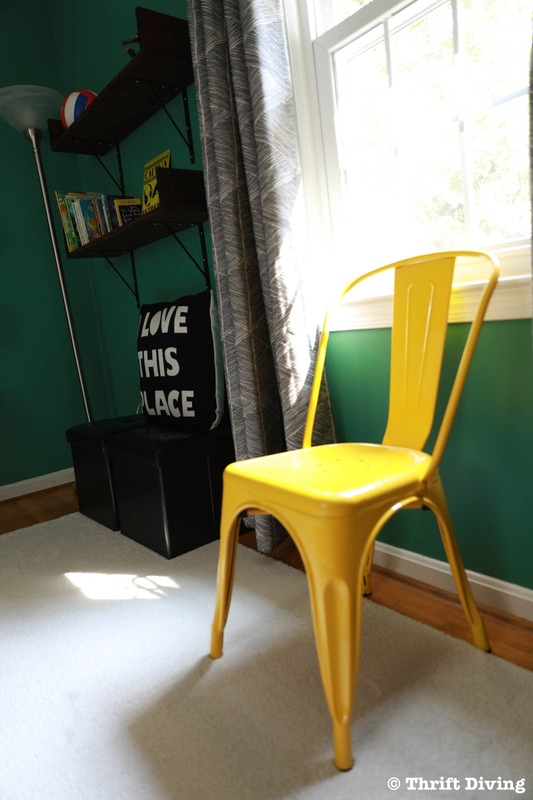 The desk isn’t done yet, but when it is, these yellow metal chairs will look great with it! 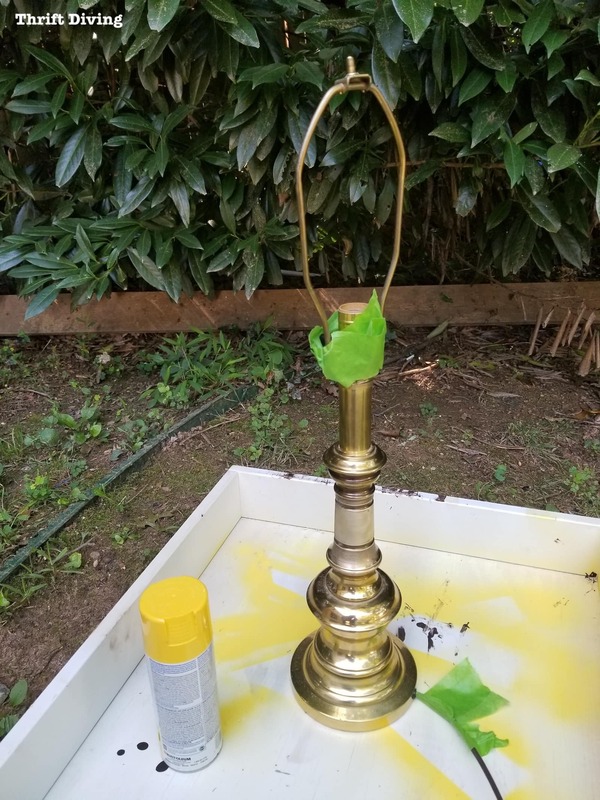 Spray Painted Thrift Store Lamp! I also wanted to pump up the “cozy” factor by giving them a new lamp for their room. This old thing from the thrift store was $10 and solid. I knew it would look good with a new lampshade and a pop of yellow spray paint. And this is what that corner looked like, too. Big difference, right?! Soooo much better! I picked up the shade at the home improvement store for $20. Don’t open that closet, though…I haven’t yet tackled that mess! And what’s cool is that I added a color-changing bulb to the kids’ freshly painted thrift store lamp, so now they can adjust the light to their mood! I hate to admit that my middle and youngest son don’t love reading as much as my oldest son. So having a huge bookcase for two kids that only pick up books if you bribe or threaten them with the loss of electronics, made no sense. They did store all of their LEGOS on top of the bookcase, but we needed that floor space. Let’s build up instead for the books with DIY bookshelves. We will be adding more books to this DIY bookshelf, but with more age-appropriate books, since most of their books were for younger kids. 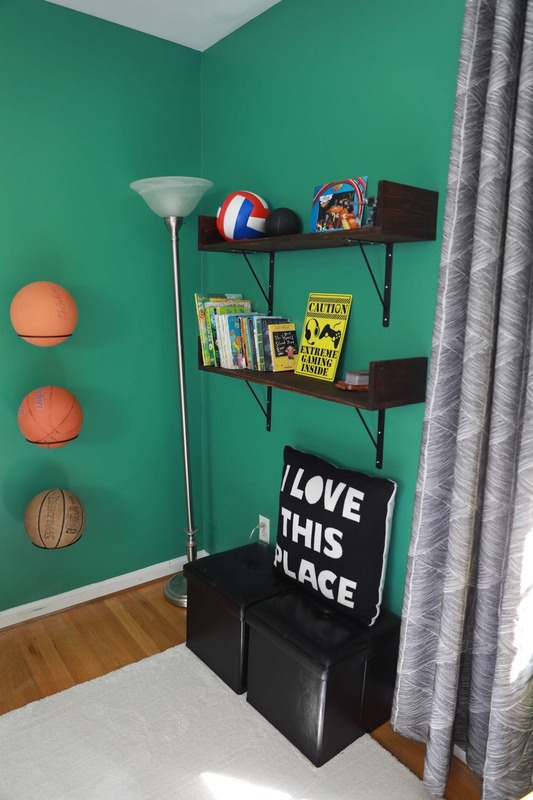 I also hung their beloved basketballs on the wall with these wall-mounted ball holder displays. The kids have really taken a liken to basketball lately, so I am sure I will be adding some b-ball touches throughout the room soon! I posted a tutorial on how to make a DIY whiteboard for under $30. This was such a great idea for the kids’ room. They can use it for writing, drawing, and keeping track of game scores when we play card games each night! Finally, A Family Hangout Spot! Every night, the kids beg me to play UNO with them. If you could see my daily schedule of projects, you’d know that I run from sun up to sun down, daily, trying to maintain my Superwoman status. My first thought is to respond with how tired I am (truth)…how I have so much to do (truth)…that we can play games on the weekends when things slow down for me (they will not). But then I catch myself and realize that spending time with them means forming memories that they’ll remember for the rest of their life. So I set aside the last items on my “To Do” list and we break out the ‘ole playing cards. And where do we play these intense games of competition?? Right here on the floor in their bedroom floor. Love this bedroom makeover? Click below to SAVE it! Looks great! Also gives boys a chance to keep it nice. Yes, you’re right! They’ve done great so far. I think they really enjoy it and seeing a nice room gives them a little motivation to keep it nice. Thanks, Nancy! 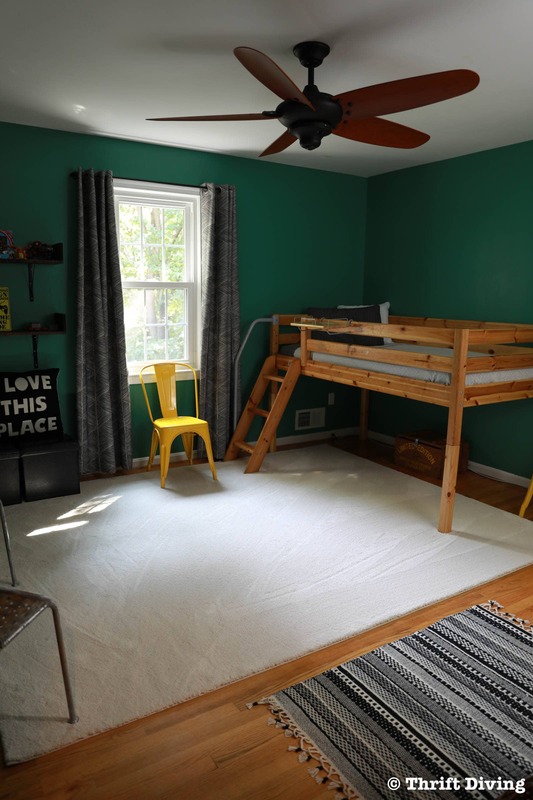 Love the transformation of your kids’ room! Your boy’s room looks terrific! I love the last pic of the four of you playing on the floor. That’s a clever way to store basketballs. It’s both aesthetic and practical. I hope back to school activities are going well for you and your boys. That is a lovely transformation! 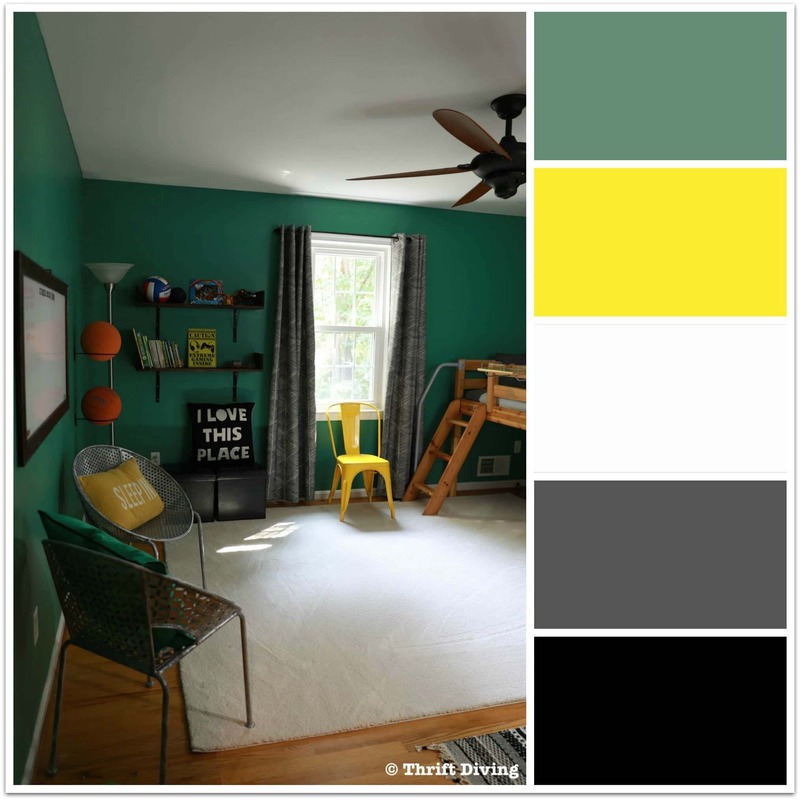 I am not at all afraid of dark or bold colors and often change up my boys rooms just for fun. 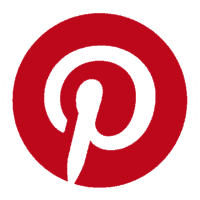 Pinning for some of these lovely ideas! That looks great! I love reading your blog, & getting lots of inspiration! nice job! looks fantastic. Love the green on the walls! I love the basketball storage system-cute and functional. I’ll be interested to see how you add the light to the fan. I’m terrified to even change out a light fixture so I’m already impressed. Great job with the makeover! Hey, Trena! I feel ya on the electrical stuff. Prior to changing the ceiling fans, we were hesitant to do much electric stuff because years ago we tried to change the lights in the kitchen and had a heck of a time! Even the electrician we brought in had a hard time. But the fans weren’t too bad! We changed 3 of them out in the bedrooms and office and by the third one, I was able to do it unassisted from hubby! 🙂 I was super proud. LOL. Glad you like the room makeover and basketball storage!! 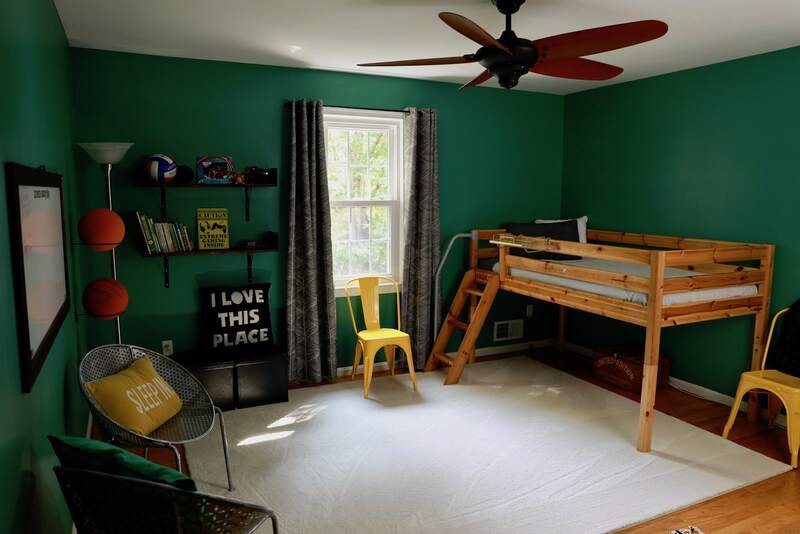 I smiled when I read you shared a room with a bunk bed that was dark and chunky with your sister, because I had the same kind of bunk bed and shared with my sister. We also rented so no special colors. We took our gold/brown shag rug from apartment to apartment until I finally ripped it out when I was 19 and my sister had moved out. We also had a hand me down dresser that may have been an original Dorothy Draper espana chest, that we wound up throwing away in the 80’s. I’m still mad about that. I love the green and the whole room! I’m sure you boys love it too, especially that comfy rug!